Have you ever wondered why granite sinks are known for their superior strength compared with the industry’s standard sinks? Naturally, granite comes from the molten rocks that are found deep within the earth. Just like those granites that are used on countertops, granite sinks provide that solid built that lasts a lifetime. However, there are two kinds of granite sinks that you can find on the market. It could either be made from natural granite or granite composite. But regardless of the type you prefer, granite sinks will always be one of the strongest and long-lasting products out there. Most importantly, each granite sink has its unique look that is formed naturally after the minerals were formed. 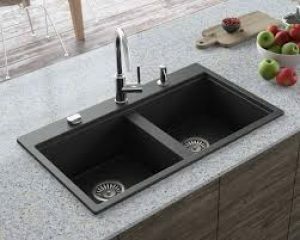 Thus, each granite sink comes with a unique natural beauty that can withstand stains and years of use with proper maintenance. As the Editor’s Choice, this kitchen sink is definitely one of the best models out there. Even though it is available at a much higher cost than its competitors, Blanco proves its rights under the spotlight. For years, Blanco plays a big role in the business industry by maintaining its respect for business ethics. As a member of the Caux Round Table, the company uses its status to introduce this product to the global market. 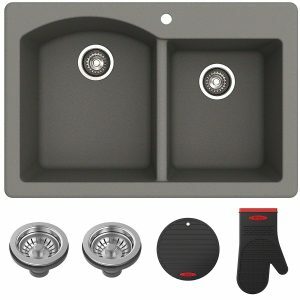 With 80% granite stone, .5 inch deck, and up to 536°F heat resistance, this sink can last for many years. 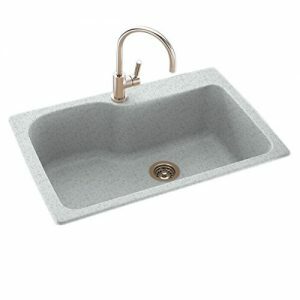 For those who are into granite composite sinks, this one is a great choice. It can withstand hot and cold variations in case a hot pot or saucepan was directly placed on it. Compared with other solid sinks, there’s a low chance that a fallen fine crystal or dinnerware on it will break. Thus, customers can keep their glassware safe and sound even when accidentally dropped in the sink. 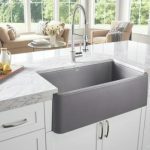 Available in 5 different colors and designs, this granite kitchen sink from Swanstone offers this Budget Pick with dual basin. But unlike other double-bowl sinks, this granite sink has a low divider that separates its 2 basins. Thus, you can place a bigger pan or pot even in between the two basins. Since it is made from 80% quartz stone, you can guarantee that is stronger than those conventional sinks. Even though kitchenware can scratch it, some serious cleaning can get rid of it easily. 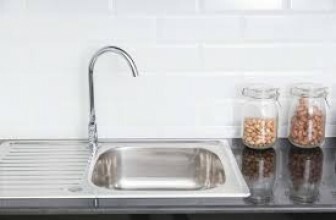 But most importantly, you can get a hold of this superior sink at an affordable price. May it be for new house construction or simply a kitchen renovation, this kitchen sink from Swanstone is a win-win. In fact, this is considered by manufacturers as “virtually indestructible” due to its strength. Moreover, its standard size makes it easier to fit in standard countertops. thus, we recommend this model for those who need a heavy-duty sink. 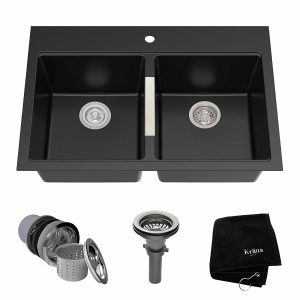 Designed with a rectangular shape and a dual mount, this kitchen sink comes with sufficient support for years. It is equipped with a sleek and modern style that makes it more attractive to any kitchen. It is also made of a meticulous process that combines acrylic resin and natural granite stone to ensure its durability. Its natural granite composite resists odor properties while its silver ions give it anti-bacterial protection. Moreover, it can resist stains, vibration, shock, scratch, chipping, and discoloration. 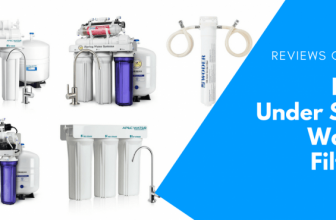 When it comes to installation, you can install it as an under mount or top mount. In case you need more holes, it already has pre-scored knockout holes that can accommodate accessories. When strength meets beauty, this is the outcome that we can recommend to those who want a cheaper option. Compared with the previous models, it’s available for less than $300 only. Considering that it is a mix of premium granite and quartz with acrylic resin, it’s still durable and reliable. It’s also versatile which we really like about it. Compared with the earlier Kraus model above, this one is way more cost-efficient. It is a dual mount sink that combines the natural beauty of granite, acrylic and real stone. Thus, it can provide a striking look and excellent performance to any kitchen. Most importantly, it is very sturdy, hygienic, and compatible with a wide range of countertops. You don’t even need to scrub it since it can be cleaned with just one wipe. If you’re a fan of Swanstone then you shouldn’t miss your chance to check this model out. Its size is perfect for those with small countertop space and less support. Its contemporary style matches any kitchen with a classic feature. It’s also lightweight compared with the typical granite sinks since it weighs less than 15 pounds only. Regardless, it can maintain its beauty thanks to its non-porous surface. Thus, it’s easier to maintain with a breeze. How Are Granite Sinks Made? Granite may not be the most common thing that you would see on every kitchen but it’s definitely a must-have. 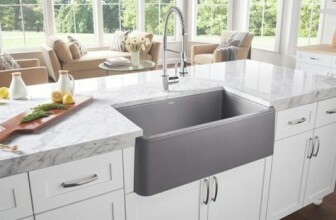 In fact, granite sinks will never get out of style even though granite countertops may not be than in-demand nowadays. Granite sinks that are made from pure or solid stone can be made in two ways. First, the basin is carved out from a chunk of granite stone. Just like regular sinks, there are also multiple sinks: double and triple-bowl sinks made of granite stone. The bowl is cleaved out of a block of granite in order to have a single granite sink. In the good old days, this kind of sink is carved manually using a hammer and chisel. Today, manufacturers use high-tech tools to carve out granite sinks faster and with more intricate details. Second, the sink is created by assembling a few pieces of granite slabs with different cuts and sizes. These pieces of granite slabs are then bonded together by sealing its seams to keep the sink watertight. 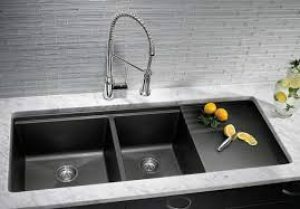 Regardless of how this sink is created, its walls and bottom part are polished thoroughly to create a smooth surface. However, some manufacturers like to retain some of the stone’s raw feeling by leaving some exposed surfaces. Typically, this “exposed surface” is found in the front part of the sink which is the closest to your body. This is also called the “broken edge” exterior which creates the raw look and texture of granite stone. The most common style of granite sinks that customers love is the farmhouse style. In other places, this is also called the apron-front granite sink which has its front part visible. This is also the kind of style that manufacturers use to show off the beauty of granite in any kitchen. But since it is carved out of solid stone, expect it to be heavy especially with multiple bows. Thus, be sure to install it on a heavy-duty countertop and support. 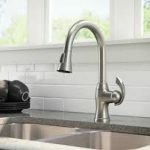 This way, you can make sure that your sink will have the support it needs to last for decades. How to Choose the Top Granite Sinks? When it comes to choosing the top granite sinks, take note that there are some things to keep in mind. Whether it’s your first time or not to get invest in granite sinks, you have to do your homework. It’s worth it to spend at least an hour on deciding which sink fits your kitchen needs the most. After all, “knowledge is power” and the only way to spot the top products on the market is to learn. 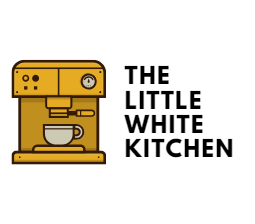 Whether you are a minimalist or not, read on to learn more. As mentioned earlier, not all granite sinks are the same mainly because there are two main kinds to choose from. Some are made from solid granite stones while some are made from composite granite. To determine the top granite sinks on the market, the first thing to know is the difference between the two. Granite – this is the original version which is made of molten rocks or magma that seep through the mantle and crust’s fissures. Once it reaches the layer under the earth’s surface, it gradually cools down and solidifies to form a solid rock. This pure granite that is formed through the natural blend of the earth’s minerals gives the sink its distinct look. But in spite of its durability and quality edge over conventional sinks, it is still prone to stains and damages. Thus, this kind of sink requires some extra care and a coat of seal annually to maintain its natural beauty. Failure to do this will make the sink vulnerable as it slowly breaks down without a proper seal. Until now, pure granite sinks are known as one of the most durable, heavy, and expensive kitchen sinks. Its required annual sealing alone means additional cost which is quite expensive so you must prepare your pockets. Granite Composite – compared with the pure granite, all sinks that are granite composite are made from 5% resin and 95% natural stone. Just like the natural stone, this one is made from blended stone crystals that are heated and molded. This process allows this engineered natural stone and resin to become solid with a consistent design. At the same time, this provides equal weight to the sink though. But contrary to what other’s belief, granite composite sinks are heavier and harder than those its pure granite counterpart. However, it is a more affordable option. Regardless of the type you want, make sure that it is properly sealed to protect it from stains and moisture. 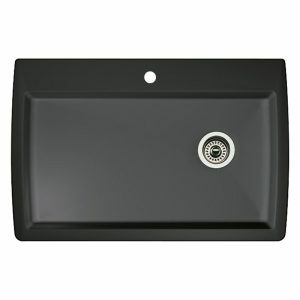 Some manufacturers already offer granite sinks that are fully sealed and ready for installation. It’s a plus point for the product and manufacturer but you still need to reseal it annually. When it comes to quality and durability, almost both granite and granite composite sinks are the same. Both are heat, scratch, and stain-resistant when properly sealed. Both also create a unique design on every piece of unit it offers on the market. However, only granite composite sinks can withstand water spots, acids, and chipping with proper cleaning though heavier than pure granite. 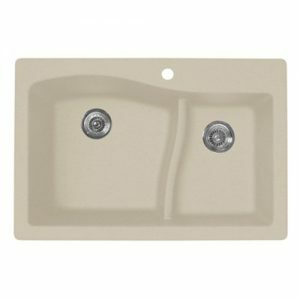 Granite composite sinks are also cheaper and require less maintenance which makes it a good steal. If you are still in love with the idea of having pure granite sink at home, it’s totally fine. Just remember that securing its natural beauty comes with more expensive costs over time. This way, you can make sure that it’ll last for decades without losing its luxurious look and strength.